Vacation in Mexico for less with luxury timeshare accommodations at Los Cabos Golf Resort. Shop SellMyTimeshareNow.com for resale and rental units and enjoy savings as significant as 70% off the retail price tag. What’s My Los Cabos Golf Resort Timeshare Worth? Get away from it all and indulge in a luxury vacation experience at the Los Cabos Golf Resort. Pamper yourself at the resort's mini-spa offering massages, facials, and more. Or, perfect your swing at the neighboring Cabo San Lucas Country Club which offers pristine greens and stunning ocean views. Other lavish amenities right on-site include a bi-level pool with a swim-up bar, stone hot tub, and dining outside on the patio at the Double Eagle Restaurant and Bar. All of this while being minutes from sparkling beaches and all the beauty and charm of Cabo San Lucas. 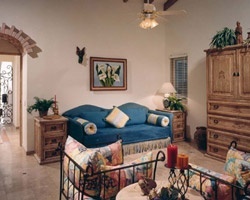 At Los Cabos Golf Resort, you have an incredible selection of unit sizes and styles for any type of vacation. Studios all the way up to four-bedroom penthouse suites with private roof decks are all in play, ensuring you will find multiple great unit options for your trip. While amenities vary by suite type, most units boast full or partial kitchens, private balconies or patios, full bathrooms, living rooms, and custom-made furniture. You'll also love taking in the views of the surrounding mountains, ocean, or golf course to add an element of luxury to your stay. Plan your retreat to Mexico today with one of our affordable Los Cabos Golf Resort timeshare resales or rentals! Complete the form on the right side of this page to get started, or give us a call at 1-877-815-4227 for more information. Affordably vacation in Mexico every year when you buy a Los Cabos Golf Resort timeshare resale. When shopping the secondary market, you'll discover an incredible selection of Los Cabos Golf Resort timeshares advertised by-owner that are priced significantly lower than the resort developer price tag. This is because developers charge sales commissions, taxes, and hidden fees in addition to the actual worth of the timeshare property. These extra expenses don't exist on the resale market. This allows you to only pay for exactly what you are buying—the market value of the actual timeshare. This will save you thousands making ownership attainable for any budget! Our inventory of Los Cabos Golf Resort timeshare resales features Right To Use fixed and floating weeks with annual usage. With a Right To Use timeshare, you own the property for a set number of years, as opposed to a deeded timeshare that you have for life. This can be appealing for those looking for many years of affordable vacations without the lifetime commitment. And choosing between a fixed and floating week allows you to pick whether you want to reserve the same week each year or choose between multiple weeks within your ownership season for more flexibility. Los Cabos Golf Resort is a part of the desirable Vacation Resorts International (VRI) brand and family of resorts. With this affiliation, Los Cabos Golf Resort timeshare owners enjoy some fantastic member benefits like internal exchange. Choose from any of the resorts within the VRI network to change up your vacation and experience a different destination each year. This program is known as VRI*ety™ exchange and is incredibly flexible. Deposit your timeshare with VRI as early as 24 months in advance and browse resort options within their available inventory. Enjoy this and other perks with zero resale restrictions. Other benefits include split weeks, cruise vacations, guest program, and discounts on extra vacation time. Beyond all of the fantastic exchange options made possible through Vacation Resorts International, Los Cabos Golf Resort timeshare owner also have the wonderful opportunity to buy an annual membership to Interval International. As an affiliated resort, Los Cabos Golf Resort can take advantage of their affordable and comprehensive exchange services. Interval International is one of the leaders in the external exchange industry, offers an extensive network of thousands of luxurious vacation ownership resorts all across the globe. Once you are a member, simply deposit your timeshare week with Interval International and choose from their available inventory to travel to a new and exciting destination. As an added bonus, Los Cabos Golf Resort is an Interval International Select Resort, giving owners a higher trading power when exchanging through Interval. Unwind on the stunning campus of Los Cabos Golf Resort. Composed of elegant Spanish hacienda style-structures and gorgeous golf course and ocean views, you will be swept off your feet while indulging in total relaxation bliss. With plenty of on-site amenities and features, you won't need to stray far to enjoy the complete vacation experience. Discover a bi-level swimming pool complete with a slide and swim-up bar, a mini spa with high-end services, stone hot tub, poolside seating perfect for sunbathing, and traditional Mexican dishes on the patio at the Double Eagle Restaurant and Bar. Get out of the sun and enjoy a tasty cocktail at Churchill's, the underground TV lounge on-site. Los Cabos Golf Resort resides adjacent to Cabo San Lucas Country Club, offering a pro shop, driving range, and ocean views along the fairways. Minutes away you'll find dazzling beaches, local eateries, quaint shops and boutiques, and even more beautiful golf courses. 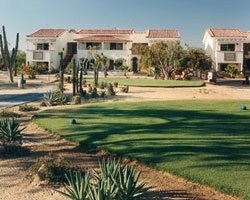 Already Own at Los Cabos Golf Resort?